The Lagos State Police Command has arrested a 27-year-old man identified as Chigozie Egegonye, for allegedly planning the kidnap of his sister, simply identified as Franca. Egegonye was said to have planned with his childhood friend and accomplice, Michael Oluchukwu, to carry out the act, stating that despite the wealth of his elder sister, she was stingy. According to the Punch, the victim and her four children had been declared missing since April 2016, when they suddenly disappeared from their home on Mayowa Street, Ago-Palace Way, Okota area of the state. 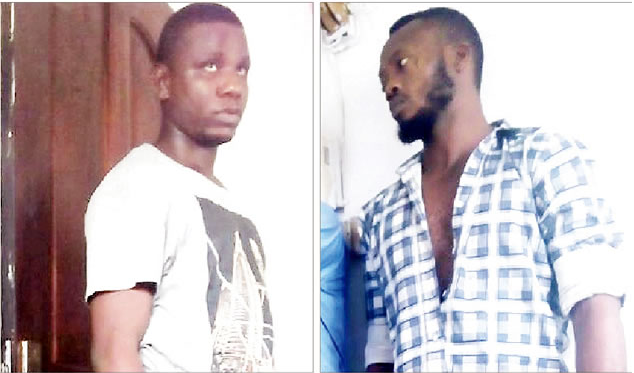 The suspect’s accomplice, Oluchukwu, a cobbler, had sent a text message to the victim, giving her an ultimatum of 12 hours to pay N300, 000 or risk being kidnapped and killed, but Franca called him and pleaded for her life, saying she could only afford N50, 000. Oluchukwu reportedly agreed and sent her his account details, (First Bank account number 3034268561 with the name Chigozie Egegonye), however, it was learnt that the victim was yet to send the money to his account when she and her four children went missing. The state Police Public Relations Officer, PPRO, SP Dolapo Badmos, who confirmed the incident, said the victim’s husband petitioned the State Department of Criminal Investigation and Intelligence Department, SDCI, Yaba, after which detectives launched a manhunt for the suspects and investigations revealed that Egegonye (the victim’s brother) was behind the plot. “Egegonye and Oluchukwu were, however, arrested by police on Wednesday after the police used the account number and phone number of Oluchukwu to track him down and he later led operatives to Oluchukwu’s house where he was also arrested,” the PPRO said. The mastermind of the kidnap said his sister fled the house due to the disagreement she had with her husband. He denied kidnapping his sister saying, “My sister and her husband are rich, but they always quarrel in the house. She had wanted to quit the marriage, but I begged her. My sister fears a lot. But his accomplice, Egegonye, who said he had learnt his lesson, noted that greed and ignorance pushed him into the act.